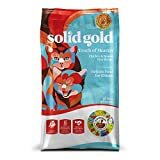 Solid Gold is a pet food brand that produces high-quality wet and dry cat foods, almost all of which are grain free, which makes it the ideal choice for pet owners trying to work around digestive issues and general kitty pickiness! Many cats struggle to adequately digest grains and cereals, as these are not a part of their evolutionary diet. As grains are quite bland, with limited scent, cats can often find them boring and unappetising, and will simply refuse to eat them. Because Solid Gold is made with high-quality ingredients, and doesn’t rely on cheap, grain-based “filler” to bulk up their product, it offers better-quality nutrition for your cat. While it is more expensive than other cat foods on the market, the fact that it has a higher nutritional quality means you won’t need to use as much of it to provide your cat with the calories and content they need, in comparison to cheaper brands, so, in the long run, it works out at about the same, cost-wise. Marketed as “pet food with a purpose”, there have, to date, been no recalls of Solid Gold pet food, making it a trustworthy, safe food to feed your feline friend. 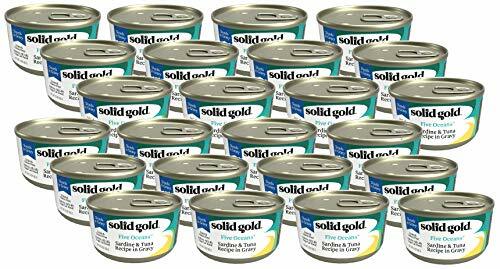 With a focus on high-quality protein, Solid Gold produces a pet food that provides a good amount of lean calories, making it ideal for active adult cats. Kittens, because of their higher animal fat requirement, would need either a complementary cat food topper, or specialist kitten food. 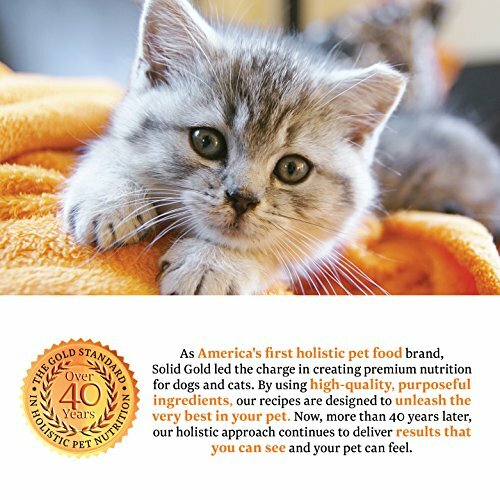 Solid Gold has been providing high-quality, holistic pet food for over forty years, giving both cats and dogs the nutrition they need and deserve. The company prides itself on being less a business, and more a gathering of animal lovers who want the best for their pets – that’s the ethos which informs their manufacturing approach, and guides them in using on the highest-quality ingredients throughout their range. By offering both wet and dry cat food, Solid Gold does something many other high quality brands fail to do: it offers cat lovers and their cats a choice, and caters to the whims and preferences of the feline species. The following reviews are all Solid Gold products, and will help you choose the food your cat is most likely to enjoy, from the range they’re certain to love. Remember that cats are individuals, and what works for other cats may not work for yours – just because all of your friends like something, it doesn’t guarantee it will agree with you, or be to your personal taste. Cats and cat food are the same way. 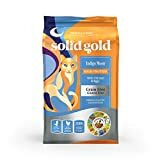 This Solid Gold cat food is specially designed to help with weight control, and includes recommended serving sizes based on your cat’s ideal weight. Because of its lower calorie count, it is also ideal for older, less mature cats, and neutered males. Made with pollock and a wide variety of healthy vegetables, this food is grain and gluten free, and includes natural oils to help keep your cat’s coat sleek and shiny. This food does have a very strong smell (which is only a problem for humans, not cats), and, being fish-based, will not appeal to some cats – the stereotype of cats loving fish are, as many cat owners have found out, somewhat inaccurate! This food also seems to help reduce the frequency of hairballs for indoor cats. 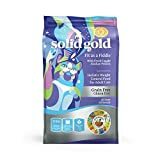 Offering both fish and poultry flavors, and thus likely to appeal to a wider variety of cats, this is a grain-free moist cat food from Solid Gold. This food works well for fussy cats, and tastes just like human-grade food, which speaks for itself as far as the quality of the food (and the amount of pure meat or fish) is concerned. This is not a grain free food (contains brown rice), and it also includes pumpkin, which, while being excellent as a pro-biotic, can cause diarrhoea in some cats. Other than the pumpkin, this dry food is packed with goodness across the spectrum, from high-quality meat through to a wide variety of fruits and vegetables, ensuring your cat gets the same quality and range of nutrition that a fully free-range cat in the countryside would get from eating a variety of herbivorous prey animals. If your cat does have issues on this food, try switching them to a grain-free variety that doesn’t include pumpkin. This is an excellent food for cats with allergies, and appears very appetizing to cats generally. It is a high-protein food, which means you shouldn’t need to use as much of it as you would a grain-based kibble. The fact that a bag will last longer because higher quality food means less food is needed to meet nutritional requirements is something many people seem to not realise when looking purely at the price of pet foods. Yes, in the immediate term, a good quality pet food will cost more, but, over the long term, it works out roughly equal. This is a grain free wet food, featuring fish flakes in gravy. The gravy offers increased hydration, and a different texture for your cat to enjoy. This can be fed as a standalone, or mixed with Solid Gold dry cat food of any variety – maybe try mixing it with a meat, rather than fish, flavored kibble, as not all cats are fish fans. The great thing about the Solid Gold pet food range is that it offers a lot of variety, including a wide choice of grain free foods. In addition, the fact that Solid Gold produce both wet and dry food means it’s easy to feed your cat a range of textures without having to compromise on quality.